The living room is set up like a trendy night club: The bouncer lets everyone except Homer in. "Non-flammable is not a challenge"
"Bart to the Future" is the seventeenth episode of Season 11. It first aired on March 19, 2000. The episode was written by Dan Greaney and directed by Michael Marcantel. "While visiting an Indian casino with his family, Bart encounters an Indian who foretells of his future. Bart learns that in the future he is a ne'er-do-well musician with Ralph Wiggum as a roommate. He goes to see Lisa to borrow money, but Lisa has her own problems, being the newly-elected President of the United States and facing a tax crisis." The Simpsons are going to a park, but when they arrive, they find that mosquitos have gone crazy and have taken over. While driving back, they find an Indian casino and stop by. Bart tries to sneak in, but is caught by the casino's manager. To teach Bart a lesson, he gives Bart a glimpse of himself thirty years in the future. In the year 2030, Bart (now at 40) is apparently going through an awkward period of his life. Having dropped out of DeVry University and with no stable job he is very much adrift. He lives with Ralph Wiggum, and they have an unsuccessful band, Captain Bart and the Tequila Mockingbirds, although Ralph is less adrift as he has sufficient money to pay the rent and bills, but grouses that he is getting sick of Bart's laziness.The two stick together through much tension, pondering the success of Nelson Muntz, who now owns a nightclub, as well as having his term "smell 'ya later" replace the word good-bye. When a band gig flops when Bart shamelessly plagarizes a Jimmy Buffett song, Ralph has had enough of Bart's freeloading, telling Bart it is high time for him to start pulling his own weight. However, rather than taking the scolding as motivation to find his own source of income, namely a job, Bart sees Lisa's move to the White House as a chance to freeload off of Lisa (and by extension, the American taxpayers), instead of Ralph. 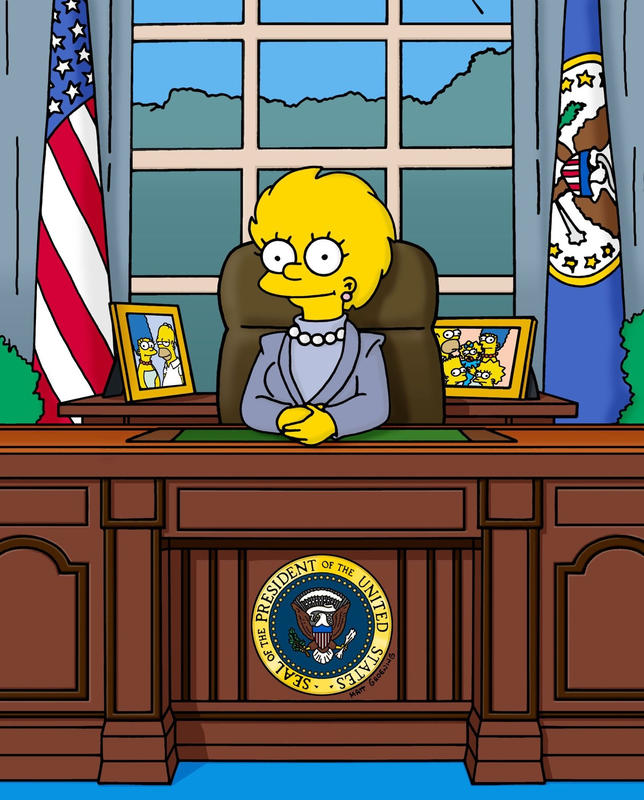 Meanwhile, Lisa Simpson (Now at 38) has the honor of being the first straight female president of the United States, although it is presumed she is unmarried, as there is no mention of a First Gentleman. Milhouse is a Cabinet member and still in love with Lisa. Kearney works for the Secret Service, and is Lisa's bodyguard. Alan Greenspan is in Lisa's cabinet and Helen Thomas is still in the presidential press corps. A previous administration made the catastrophic choice to invest in the nation's children. Thanks to them, America is in the midst of a massive crime wave. Well-balanced taxpayer-subsidized breakfast programs for children has created a generation of ultra-strong super-criminals; midnight basketball taught them how to function without sleep. The U.S. is also completely bankrupt - They've sold the "purple mountain majesties and amber waves of grain", among other properties that they do not even own, but still rely on foreign aid from Europe and China. Lisa and her advisors decide to impose a massive tax hike, agreeing to call it a "temporary refund adjustment" so the public don't catch on. After being evicted from his home, Bart decides to go visit his sister, intending to stay in the private quarters of the White House and mooch off the taxpayers. Bart makes a nuisance of himself by having Marine One fly in Ralph, and hitting Lisa with his frisbee during a speech. When Lisa makes her presidential address introducing the "temporary refund adjustment", Bart crashes in, promoting his band. Bart inadvertently gets Lisa to admit the truth about the tax hike live to the nation, which causes her approval rating to plummet. Lisa then tells Bart she has an important mission for him, asking him to spend some time at Camp David with his friends so they can work on a "coolness report". Bart takes this seriously until he is visited by the ghost of Billy Carter, who informs Bart that Lisa had sent him on a wild goose chase to be out of her hair. Bart finally realizes he has been nothing but an embarrassment to his family, and works to be a better man. Because of America's massive national debt, Lisa meets with the countries to whom money is owed. This does not go well, until Bart shows up and uses his skills at stalling debt collectors to save the day. In return, Lisa promises Bart she'll ”legalize it“. While all this was going on, Homer, with Marge in tow, has been searching for Lincoln's gold, tearing up the White House in doing so. He finally succeeds at finding a letter from Lincoln saying that his "gold" is the American people. While Marge finds it touching, Homer is enraged that it was not real gold. The vision is over, and Bart apparently learned nothing from it. He is pleased by the fact that he has his own band and describes Lisa's position to her as "some government job." Maggie (now 31) does not appear in this episode's future, though we see her baby daughter, named Maggie Junior. The DVD commentary mentions a deleted scene where we learn that she's an astronaut, which was shown on TV commercials advertising the episode, but not in the actual episode itself. It is included as an easter egg. This episode, like "Kill the Alligator and Run", is often considered one of the worst episodes in the show's long history, receiving almost universally negative reviews from critics and fans alike. 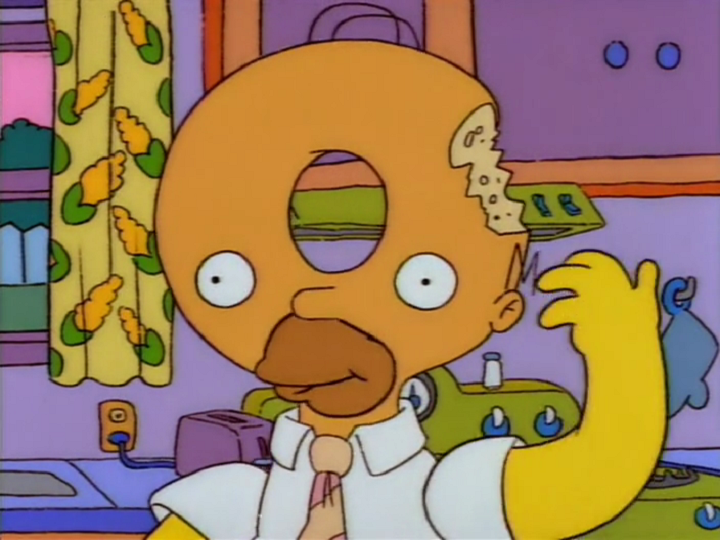 Entertainment Weekly named it the worst Simpsons episode of all time, stating that, "while Bart to the Future was likely better than anything else on TV the week it first aired, even Mojo the monkey could've banged out a more inventive script," and that, "We didn't know it was physically possible for something to both Rot and blow." The episode pokes fun at its own writing with the B-plot about Lincoln's gold, where the sachem says "I guess the spirits felt the main plot was too thin". Modified on December 27, 2017, at 19:25.